There is a wave of excitement in my family as my youngest son Rigden Subba began his much-awaited academic journey since yesterday. Till now he has been his mother’s best companion at home, living with full of childish innocence and smiles. So the first day was certainly a strange experience for him. Although he had promised that he would not cry in school as his elder brother had done on his first day in school four years ago, it seems he did silently shed some tears on the way back home yesterday. I am sure he must have felt very strange in that new environment. For now, my wife is giving him company in the school, waiting for him all day and helping him have lunch or go to toilet during the intervals. He has been told that after a while, he has to be alone and that his mother will only come to get him home after the school hours. He has accepted this upcoming ordeal that he has to face. I am sure he will soon learn to be independent especially after he gets familiar with the environment and his friends. The problem with him right now is that he is normally a silent boy and that he doesn’t easily mingle with others. So, most of the time, it seems he is seen alone in the classroom. But with the passage of time, I hope he would gain some confidence to open up and interact with others. He has completed his sixth birthday in December 2015 and he is now mature enough to be in Pre-primary grade. We didn’t send him to nursery or private schools just because we didn’t want him to stress out too early. We had seen other kids being tortured to study what their brains couldn’t even comprehend at their age, and hence, we decided to let him go to school at the legally appropriate age which the government schools follow. So, he has enjoyed the full six years of his early childhood like a free bird, exploring the world in his own way. As a regular viewer of children’s programs and cartoon movies on television, he can already fluently speak Hindi, Nepali and some words in English. However, he has never been with other children who speak Dzongkha and as a result, he doesn’t understand Dzongkha language. Those children who come to my house rather choose to speak to him in Hindi instead of Dzongkha. 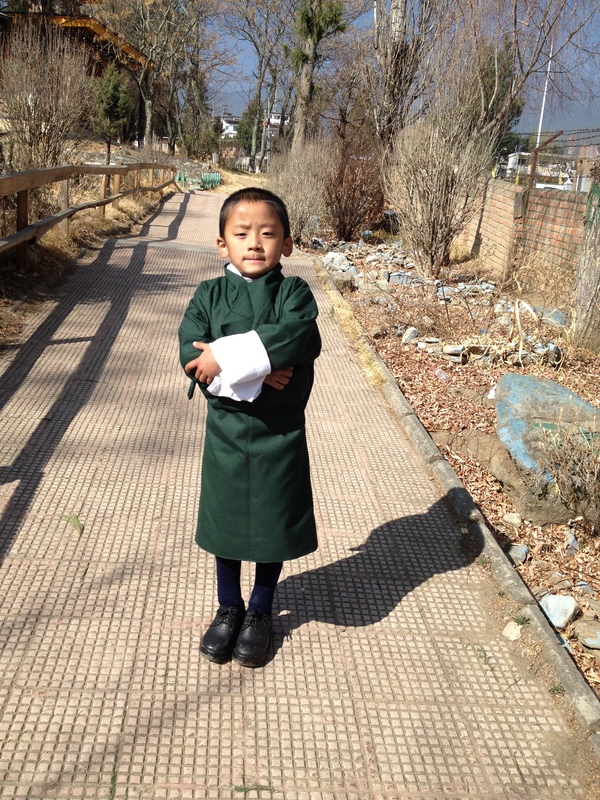 So on his very first day in school, he was worried how he would be able to communicate with others in Dzongkha. 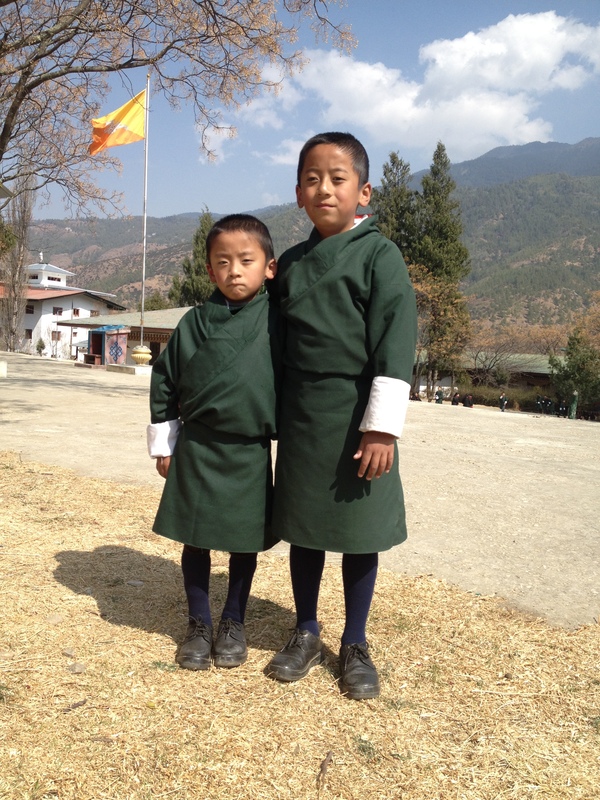 But we told him that even his elder brother had started his school like him and that he would soon learn how to speak in Dzongkha. Now I have started to teach him Dzongkha bit by bit. I feel I should have started this much earlier. One good news I have got is that the teacher who will be teaching him is one of the most patient and caring teachers in Changangkha Middle Secondary School. I am very grateful to Madam Ugyen Pelmo for her consistent hard work and passion to work with kids. She has successfully mentored my eldest son Thukten Subba who is now in Grade 4. I know she has been one of the most loved and respected teachers in the school who knows exactly how to deal with children. I feel lucky that even my youngest son is going to be mentored by the same teacher who had made my eldest son what he is today. I know it won’t be easy for her to guide my child and help him make meaning from what he scribbles on the paper. But I am sure she has the heart to take my son’s tender hands and help him know the unknown and discover the secrets of nature. It’s just a small step my son has made today but he would have to pull himself up through the wilderness of time as he grows up. There are endless things he has to learn and I believe that his teachers have the keys to those wonders. In addition to the wonders of books, he has to learn to understand himself better, his values and realize his own potentials in the future. As he walks to his school with a cute little bag on his back every morning, he carries with him the dreams and aspirations of us, the parents and the nation. As parent, I always see him as a caterpillar just now that would come out of its cocoon one day as a beautiful butterfly. May our blessings and wishes always remain with him and may success always be on his side. May the God of Wisdom bless him right from now and may all his dreams be fulfilled. He definitely has to win the battles on his way and become a real human being blest with all the good values and qualities of a true man one day.